This study estimates the effects of open-enrollment charter schools on student performance in traditional public schools in Arkansas. The paper examines the change in Iowa Assessment scores for first and second graders across Arkansas school districts between the 2014-2015 and 2015-2016 school years. The ordinary least-squares regression estimates demonstrate a positive and statistically significant relationship between elementary charter school enrollment and traditional public school Iowa Assessment scores across districts, controlling for relevant factors. Improvements in traditional public schools’ math, reading, and language test scores were greater in school districts that had a larger percentage of students enrolling in charter schools. The most influential impact of charter schools on predicted test scores was in math, where a 1% increase in elementary charter school enrollment led to a 0.13 predicted improvement in normal-curve-equivalent test scores across Arkansas school districts. To ensure teacher quality, states require teachers to pass qualifying exams to obtain a teaching license. This study examines whether there is a positive correlation between teachers’ effectiveness and their qualifying exam scores. Taking advantage of the fact that Arkansas does have some teachers who scored less than the minimum qualifying score, this paper evaluates whether or not students whose teachers score higher on standardized tests outperform students whose teachers score lower on the tests. The study finds no significant difference in effectiveness between teachers that pass the Praxis I teacher certification exam and those that fail. The implication of Shuls’s finding is that instead of screening out ineffective teachers only, Praxis I exams actually screen out potentially high quality teachers in Arkansas. 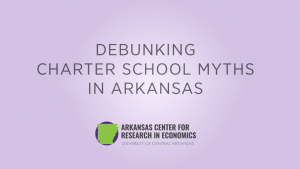 This policy review addresses some common myths and misconceptions that many Arkansans have about charter schools in Arkansas. This review debunks five of the major myths used by opponents of expanding access to open enrollment charter schools: Open enrollment charter schools don’t enroll many black or Hispanic students, Education outcomes at open enrollment charter schools are worse than those at traditional public schools, Open enrollment charter schools hire underqualified teachers, Open enrollment charter schools receive more public funding than traditional public schools, and that traditional public schools will be forced to shut down because they can’t compete with open enrollment charter schools. How Charter Schools Improve Student Outcomes – op-ed published April 30, 2018 by ACRE Research Assistant Aaron Newell in the Log Cabin Democrat. For school choice: Competition better for all op-ed published January 27, 2017 by ACRE policy analyst Dr. Mavuto Kalulu. Arkansas Democrat-Gazette. Shortage Solution op-ed published September 23rd, 2016 by ACRE policy analyst Dr. Mavuto Kalulu. Arkansas Democrat Gazette and Arkansas Online. More to Choose op-ed published July 30th, 2016 by ACRE policy analyst Dr. Mavuto Kalulu. Arkansas Democrat Gazette and Arkansas Online. Celebrate School Choice op-ed published February 13, 2016 by ACRE policy analyst Dr. Mavuto Kalulu. The Jonesburo Sun. Lower the Screen op-ed published December 3, 2015 by ACRE policy analyst Dr. Mavuto Kalulu. Arkansas Democrat Gazette and Arkansas Online. Nothing to Show op-ed published September 28, 2015 by ACRE policy analyst Dr. Mavuto Kalulu. Arkansas Democrat Gazette and Arkansas Online. Happy Birthday, Sir. op-ed published July 31, 2015 by ACRE policy analyst Dr. Mavuto Kalulu. Arkansas Democrat Gazette and Arkansas Online. Myth 5: Traditional Public Schools will be Forced to shut down Because they can’t Compete with Open Enrollment Charter Schools by Dr. Mavuto Kalulu – posted on the ACRE Review on February 10, 2017. Myth 4: Open Enrollment Charter Schools Receive more Public Funding than Traditional Public Schools by Dr. Mavuto Kalulu – posted on the ACRE Review on February 2, 2017. Myth 3: Open Enrollment Charter Schools Hire Underqualified Teachers by Dr. Mavuto Kalulu – posted on the ACRE Review on January 20, 2017. Myth 2: Education Outcomes at Open Enrollment Charter Schools are Worse than Those at Traditional Public Schools by Dr. Mavuto Kalulu – posted on the ACRE Review on January 13, 2017. Myth 1: Open Enrollment Charter Schools Don’t Enroll Many Black or Hispanic Students by Dr. Mavuto Kalulu – posted on the ACRE Review on December 16, 2016. Dispelling Myths About Open Enrollment Charter Schools in Arkansas by Dr. Mavuto Kalulu – posted on the ACRE Review on December 8, 2016. Charter School Myths and Facts by Dr. Mavuto Kalulu – posted on the ACRE Review on March 29, 2016. School Choice Gives Your Child $200,000 by Dr. Mavuto Kalulu – posted on the ACRE Review on July 10, 2015. Change Coaches’ to Improve Arkansas Education – posted on the ACRE Review on July 1, 2015. What’s the best way to improve K-12 education in Arkansas? A video by ACRE argues one way to accomplish this goal is by improving school choice through the expansion of open enrollment charter schools. Unfortunately, the debate over expanding access to open enrollment charter schools in Arkansas has been plagued by many myths. This video debunks five of the major myths used by opponents of expanding access to open enrollment charter schools.